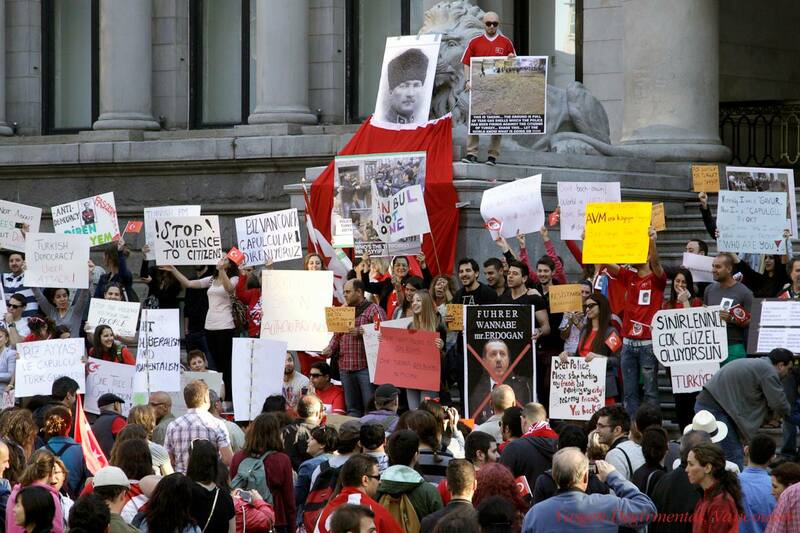 In Vancouver, people gathered twice on the 31st of May and the 3rd of June in order to support the resistance in Turkey. Around 70 people participated at first and around 500 to the second demonstration. In the second demonstration, petitions were prepared to urge the Canadian government to officially denounce the Turkish Republic’s current government and the police violence againts the protesters. Signatures were collected for these petitions from the people of the major cities of Canada, such as Montreal, Toronto and Ottowa. As of now, number of the signatures have reached to 1000. As decided, petitions will be submitted to the Canadian government in the next week. The media in Vancouver showed intense interest to the demonstrations which were also supported by Greenpeace and the Green Party. The Green Party criticized the Canadian government for remaining silent. photo: by Jasgen Değirmentaş,Vancouver, Canada. This entry was posted in Worldwide protests and tagged Canada, Vancouver, worldwide protests on 10 June 2013 .